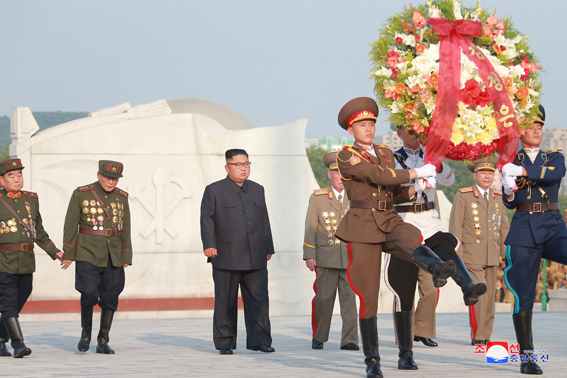 Kim Jong Un, Chairman of the Workers’ Party of Korea, Chairman of the DPRK State Affairs Commission and Supreme Commander of the Korean People’s Army, visited the Fatherland Liberation War Martyrs Cemetery to pay homage to the fallen soldiers of the KPA on July 26 to mark the 65th anniversary of the victory in the war. 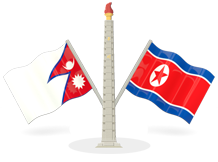 The wreath-laying ceremony was attended by Army General Kim Su Gil, director of the KPA General Political Bureau, Army General Ri Yong Gil, chief of the KPA General Staff, Army General No Kwang Chol, minister of the People’s Armed Forces, and war veterans Yang Hyong Sop, Ri Myong Su and Thae Jong Su. The national anthem was played solemnly. And amid the playing of the wreath-laying music, a wreath was placed in the name of the Supreme Leader. Kim Jong Un paid a silent tribute to the memory of fallen KPA soldiers who dedicated their precious lives to the sacred war for the Party, revolution, country and people. Saying that the indomitable fighting spirit and heroic feats of the martyrs who defended the Party, revolution, country and people at the cost of their lives would go down in the history of the country forever, he expressed his conviction that all the service personnel, working people and younger generations would reliably carry forward the history and tradition of invincibility of powerful and dignified socialist Korea.